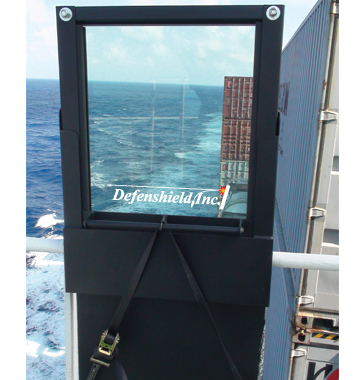 Rail Cap™ | Defenshield, Inc.
A higher level of maritime security. An armor and glass system designed to add ballistic, blast and fragment protection to shipboard and architectural railings. Once installed, the unit creates a protected position with a full field of vision and the ability to return fire. It also serves as an effective hostile activity deterrent. The Rail Cap is ideal for use on commercial and military ships traveling in high-risk areas, as well as guard towers, prisons, stadiums, arenas and government buildings. Rail Cap units are also effective for maritime anti-piracy use. Their universal fittings enable the units to be easily and securely attached to a variety of railing configurations. 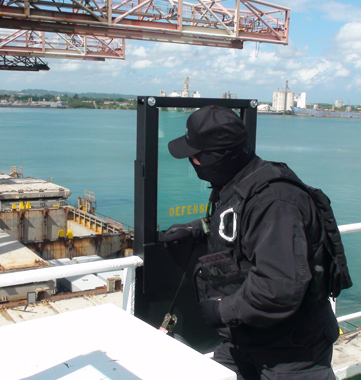 By adding transparent armor to a ship’s railing, personnel are able to spot and respond to approaching threats while remaining protected from gunfire, blasts and other attacks. Constructed of transparent armor and durable powder-coated steel, the Rail Cap is weather resistant and capable of withstanding the extremes in maritime environments. Each standard 2-foot unit provides 10 square feet of protection, up to NIJ Level IV 30-06 AP resistance. Can be easily transported throughout the ship by two people. Modular design makes replacing damaged glass components quick and easy — no tools required. Custom sizes and finishes are also available. Rail Caps are a stand-alone, modular device that can easily be integrated with other ballistic equipment produced by Defenshield, including the RPG Wall, Fox Hole, or Mobile Defensive Fighting Positions.